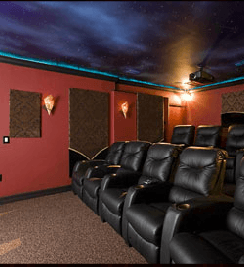 About | Infinite Signature Home Theatre Designs, Inc. Since I was 3 years old I was always intrigued by the sound of music. As I aged, the interest and passion of sound and video kept growing in me. I will always remember my first year of college when I got a job in campus in the audio video department. I saved up enough money to buy a 20 watts per channel Pioneer receiver and turntable along with a pair of used Bose 301's. I thought I was in heaven as listened to the tunes of Boston. I graduated from the University of Dayton, Ohio in 1988 with a Bachelors degree in Industrial Engineering and from then till now I have a wife two daughters and twenty two speakers. We strive to give you the entertainment experience you've always wanted. Our Service is impeccable and our team of professionals have over 30 years experience installing state of the art systems.